New momentum for this Heidelberg initiative. 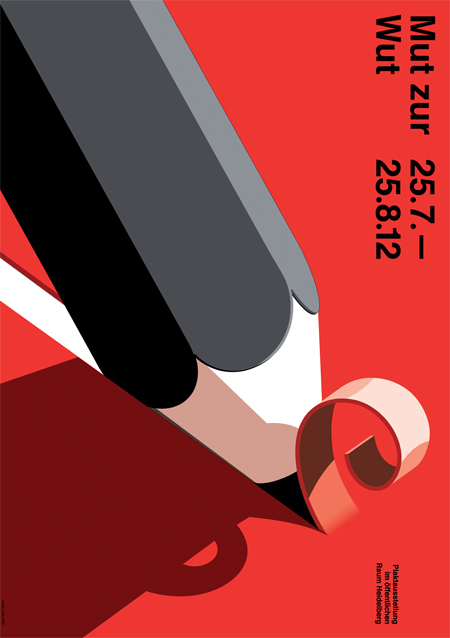 Above: Mut zur Wut 2012 call for entries poster by the inimitable Felix Pfäffli. Founder and organizer Götz Gramlich has once again assembled an impressive international jury and vital exhibition opportunities on the streets of Heidelberg. Building on the success of the 2010 and 2011 events, all indications are that this celebration of posters is here to stay. The deadline for submissions is May 31, 2012 and interested participants can upload those as of April 1. In the meantime, download the event guidelines here and follow MzW 2012 on Facebook here. UPDATE: Winners announced and featured on Posterpage here. This entry was posted by Erik Brandt on Tuesday, March 20th, 2012 at 10:55 AM	and is filed under Aktuell, Education, Geotypografika, Globalization, Graphic Design, Illustration, International, Internet, Musica Viva, News Links, Typografika, Typography.